This excellently produced series of books, branded under the Sterling Milestones banner follows a consistent format. Each book contains 250 individual ideas encapsulated in a picture and a page of text. Organised in roughly time order each book expands the core ideas and discoveries in a STEMM related field. My personal favourite is The Space Book which starts with the big bang, rolling through early discoveries of the planets and calendars towards current activities in space and onwards to how the universe will end. Full of facts and contextual pictures this book really brings alive that unique combination of engineering and exploration which is the discovery and exploration of outer space. Each book starts with an introduction to the field and finishes with a comprehensive index, Notes and further reading followed by photos credits. 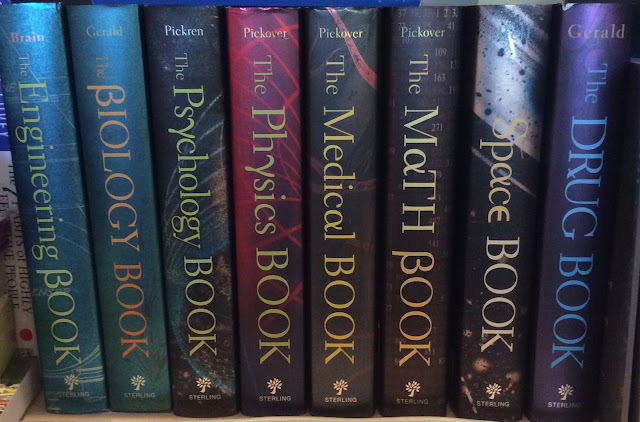 Most are offered by Chris Pickover but other authors have some of the titles. Is available via Amazon or ABEbooks as usual.